Is America Turning into Europe Right Before Our Eyes? That headline from the Freakonomics blog caught my eye this morning. While Americans are slowly changing their evil, car–loving ways (mostly because of skyrocketing gas prices), we certainly have a long way to go before we get close to European transportation standards. To support the claim, the post mentions bike sharing in Washington DC among other reasons. To that I add the proliferation of European–style bike shops that seem to be popping up all over. 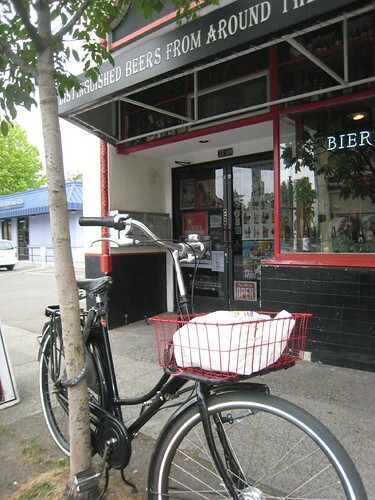 In the past year, Seattle has welcomed Dutch Bike Co. Seattle and Portland has embraced Clever Cycles. Both shops are selling everything they can import and by all indications seem to be doing quite well. Trains? Bicycles? Americans leaving cheap housing in the suburbs for life in the city? Who would have thought—even five years ago—that alternative transportation would be in the news? In our little corner of Seattle, I’ve noticed more people riding to work and using their bikes for errands. Just last week I ran into a few different friends who were going to work or taking their kids to activities on their bikes. That’s definitely a first. For most of the past year I rarely saw anyone I knew on a bike. But lately I can no longer assume I’ll always have a place to park my bike at the grocery store or the library. Sometimes, gasp, the racks are full. It gives me hope that biking is catching on when I see full bike racks. Maybe if these trends continue we’ll be on our way towards a more European or Asian transportation system in the US. The progress is encouraging, but we certainly won’t be catching up any time soon. What do you think? Have you noticed transportation changes where you live? This entry was posted in alternative transportation, bigger than here, bikes, news and tagged alternative transportation, America, cycling, europe, news, Shift. Bookmark the permalink. I’ve noticed more bicycles, but I’ve definitely noticed more two-wheeled vehicles in general (scooters, motorcycles and the like). I’m in Walla Walla, WA- a town of 25,000 in the SE corner of Washington. I’ve noticed it too, and I’m one of those n00bs. Let’s wait and see if the bike racks are still full in late November. I hope California has better luck with high-speed rail than Florida did. Florida residents overwhelmingly voted for a high-speed corridor connecting Tampa and Orlando, with other legs to follow. Then, after many hundreds of thousands of dollars of environmental impact studies, feasibility programs and design workshops, all but a tiny bit of the original plan was scrapped when those same voters were mislead to vote for ending of the referendum and subsequent funding for the program. Still, it is refreshing to see that we as a nation are starting to wake up to easing road congestion and implementing other transportation choices. We’ve got a LONG way to go, though. The answer is yes. In NYC Streetfilms can’t even keep up with the rapid changes in street geometry with more space afforded bikes and peds. It is almost dizzying its pace and we are seeing some of the top cities now being pitted against each other to see how much faster they can change things. Definitely, some change, and definitely, still along ways to go. Although I do see many more bikes than usual right now (meaningless until the rains start), I am still getting pulled over by both the Renton police and the King County sherrifs and told that I am “impeding traffic” and that I need to ride on the sidewalk. No, of course that’s not what the law says, but debating with an officer is a sure way to escalate that sort of situation. One sign of the proverbial “tipping Point” will be police officers who are actually familiar with the law as it relates to bicyclists. I’m not holding my breath. I’ve noticed down here in Portland. More people riding, more people being stupid. I saw a guy riding today, we were on a one way street, I was in traffic as I can go as fast as the cars in this section. He rolls on the left hand side almost through the light but instead noticed the bus heading towards him so he slows and then almost falls because he couldn’t get out of his clipless pedals. I had just passed this guy on a hill where he was struggling to hold a line and that was creating a bunch of unsure car drivers. People who regularly run lights and stop signs promote other new riders to do the same. It’s a shame that it is so uncool to be safe and sane these days. I love the site. I’m so happy when there are new posts. Keep riding. Part of the problem is that there are people who are starting to cycle who haven’t been on a bicycle since they were kids. They may remember how to RIDE a bicycle, but they don’t remember–if they ever knew–how to DRIVE one. I see so many more bicyclists now. It’s fun to wave or give a head nod to the ones going the other way, like we have our own secret code. If only the drivers whizzing past us could feel our joy! PS: I’m loving my Xtracycle. Thanks for your input. I’m on vacation, so today we decided to bike around Bainbridge Island. We counted 83 bicyclists getting off the 7:40 run into Seattle. Twice last week I was stopped on the West Seattle swing bridge for an opening I counted 30 riders one day, 27 the next. I would say a heck of a lot more people are biking. I live in a small, post-logging town – Hoquiam which along with Aberdeen has a population about 25,000 together. I see way more bikes than I did even a year ago. I’m the only X (with kids or otherwise) I see on the streets, but I’ve had a lot of favorable responses and questions and given out some flyers. We still don’t have bike lanes and many cyclists here ride all sorts of different ways (facing traffic, on the sidewalk). But I see a lot more people out and even car traffic is friendlier than it used to be. Of course I’ve noticed. In Portland, it’s hard not to. Thirty years ago I was a lonely bicycle commuter, riding 3 miles each way to and from my high school in Gresham, Oregon. In 1978. no self-respecting teenager of driving CHOSE to ride a bicycle everywhere — except me. I flunked my driving test at 17 partly on purpose so my dad would leave me alone about driving. Fast-foward to 2008, and on my morning commute (now 5 miles each way from home to work and back) I am almost surrounded by other bike riders. It’s nice not to feel so alone anymore. Its a great but strange feeling for the long-time cyclist to become just one of the many. I first experienced this 8 years ago when I moved from Palo Alto, CA to Groningen, the northernmost city in the Netherlands. Groningen has a couple universities and the highest density of cyclists in the western world. The very first thing I did in my first morning there was to buy a Dutch bike and join the traffic. Despite being a very experiences cyclist (more than 15 years of commuting by bike and 15 years of competitive cycling) it was actually scary at first. At “rush hour” there are so many cyclists that riding your own pace can be impossible and the roads will back up for quite a ways at traffic signals. Unlike in Amsterdam people actually stop for a red light there. But once the novelty wore off, the realization set in that the fear, stress and frustration of competing with automobilists had disappeared. What a wonderful feeling, to be surrounded by other cyclists, equally unprotected, getting just as wet and cold as yourself, with just the noises of student bikes: than the clacking of cranks against hanging kickstands, tires against bent fenders stays etc. It’d be very strange for me to ride in the US again, but now amongst other cyclists. What an improvement! I dont’t know where to start. Presently I am at home recuperating after a motorcycle accident I had 13 week’s ago. Part of my PT was the bike, so I figured I’d dust off my mountain bike that I only rode twice a month and start going to pt on it. That was a month ago. Now I ride my bike most places. I live in Eureka ,ca. and about 3 miles from town. Lot’s of big hill’s that I cant do yet, but getting their. I found this site and I love it. I was in the US COAST GUARD for 20 years mostly on ships and I took a bike with me on every deployment and got to ride in 13 countries. Alot of us did this. Anyway im not new to biking just new to the idea of making those trips to the store and wherever else on my bike instead of my truck. The motorcycle is for sale. I’ve chosen to take my chances on the bicycle instead of it. Been of work since may 14th 08. anyway I’ve been doing some surfing on the internet mostly all bicycle sites. I’ve Put street tires on my bike,added a pannier on the rear rack, and put a cool little bell on the bars. It’s funny people dont get pissed when I give them a jingle to alert them of my presents they either smile and move or just look at me and move. No hard feeling’s yet. I’m riding 6-15 miles per day so far. not bad since I fractured my right tibia, and now have a large piece of stainless steel and six ugly screw’s in my leg. up to that point I was riding the motorcycle everywhere to save gas and I was noticing more motorcycles, scooters, and bicycles up here. When I go to the bike store I see 15 or so old bikes in the shop with repair tags on them and the mechanic say’s there’s about a one month wait to get a bike tune up if you needed one. Anyway cool site .